Some of you may have heard me about my perpetual temp jobs that boring doesn’t even begin to describe in the least. Well if the jobs allows, that is to say I don’t have to talk to whiny people and I don’t have to answer a phone, I listen to audiobooks. It’s something that has kept me sane through many a temp job. Well, at my latest job, reading about whiny people and train delays, Rachel Vincent’s Soul Screamers series came to my attention. Since Rachel Vincent is one of my favorite authors, I took a chance on the series and I haven’t been disappointed at all. Of course, to share the glee I asked B. for a review of the series. 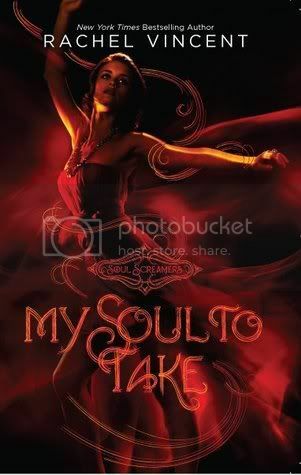 So get ready to be awed by the first installment: My Soul to Take. To start, the series is a Young Adult book and it’s told from Kaylee Kavanagh’s point of view. She’s a High School student who doesn’t know about her heritage, about who she really is and what she can do. As a result she spent a week in the Psych Ward of the local hospital. Poor her. Now let me tell you, in the paranormal world there are some freaky cool abilities to have, but the ability to “scream” for the about-to-be-deceased isn’t one of them. Yup, that’s right. Kaylee is a Bean Sidhe. That would be a Banshee. Yes, the women who scream when someone is about to die. Only she doesn’t know about it. She only knows that she sometimes sees “shadows” around someone and then gets a panic attack. That is until one night, when you with her best friend Emma, she meets the uber cutey Nash. When she sees a shadow around a fellow dancer while dancing with the cutey, she starts to panic. Only Nash calms her down and it turns out he has a secret of her own. The ball gets rolling fast and furious from there on out and you’re on a rollercoaster. The story is not all about Kaylee discovering who she really is. There is also something not quite right with female students dropping like flies. Kaylee and Nash get help from Tod. Now Tod, he be mine. MINE I tell you! So stay away! He’s a Reaper. Yes, that would be a Grim Reaper, one who harvests souls. But like everyone in this story, Tod also has a secret. The story is fascinating and well thought through. It’s not just your average teenage romance with a lot of angst. It has depth and a great cast of characters. The characters are not perfect, the have their flaws and they make their mistakes and I found that refreshing. While most stories have a tendency for a happy ending, this ending is happy with a flaw. It’s realistic in that the story shows that not everything always ends with the hero and heroine on top. No worries. No one dies, well no one who isn’t already dead or important! The only real flaw I found in the story is the theme of predestine or pre-destiny. It’s actually a religious/Protestant term that says everything is preordained. When you’re born, when you die, what you do. It comes back in this story with the “list of the dead” Tod has. He gets a list with names of who dies and when. It’s probably there for the story and the existence of Reapers, but I’m a firm believer of making your own destiny. I don’t think all is ever so easy. Especially not a list of the dead. Btw, the covers are also very beautiful! Sounds really good. I'll keep an eye out for it. Great review! I still haven't read any of her books. I might try this one first as it is a new series. Great review! This sounds like something I might like although I really shouldn't collect any more series. lol. Ana: thanks!! :-) yeah, it just has too many complication. Though to be fair, I think it was mostly for the story's sake! Let me know what you think of the book! Linda: Oh it does!! It's well worth the read! Sounds interesting. There is also another theory about death moments like that. There are times when a person "can" die, but it isn't certain. Only that events lead up to that moment and a decision in another direction takes you to a different outcome. That might have made the book seem different. Hm... now I'm curious. Thanks for the review! I've got this in my TBR but might bump it up now! I like quirky and witty...sounds good! Thanks Lis! :D I so gotta read these books, cos I really like Rachel Vincent so why not her YA books too. Sounds good. This is an author I've been wanting to try for awhile. I have the first three but I haven't gotten around to reading them yet. I hope they're as good as I want them to be. Or was this the JUST GO GET IT post that you didn't want to write the review for because it was just that good??!! It sounds like another great book. :-D Fabulous review! i love those angsty teen romances!! great review!